League leaders Accrington lost top spot after a 12 run home defeat by a Steve Dearden inspired Haslingden in front of Sky Sports TV cameras filming David Lloyd's comeback match. 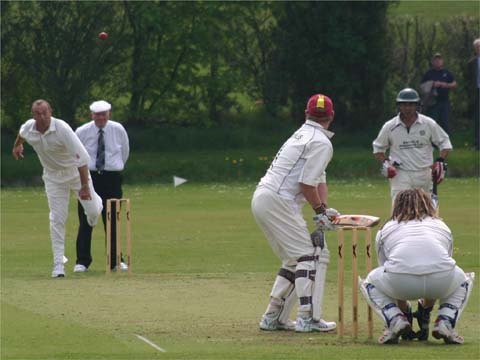 Dearden picked up the vital wickets of Stuart Crabtree (27) and Toby Bulcock in successive balls before sending back Graham Lloyd, who had made a majestic 78, to virtually seal the match for Haslingden. Accrington again lost early wickets but at 28-3, Crabtree and Lloyd dug in and put on 93 for the 3rd wicket before Dearden struck a double blow which brought David Lloyd to the crease. After a sketchy start, the former England man made 15 from 31 balls, including two boundaries, before holing out to Mike Ingham on the boundary off Graham Knowles. Simon Hanson went after making 8 but when Graham Lloyd departed after hitting eleven boundaries and a six, Haslingden were in the driving seat. Jimmy Hayhurst (22) and skipper David Ormerod (11) added an unbroken 9th wicket stand of 42 to earn the home side four valuable points. Haslingden skipper Graham Knowles had earlier top scored with 76 in his team's 226-7, adding 112 for the 2nd wicket with professional David Bandy, who hit 60, his maiden league half century. Graham Lloyd held a fine catch in the outfield to dismiss Steve Dearden for 7 and then David Lloyd earned the biggest cheer of the afternoon for sending back Bandy with a diving catch round the corner off Damian Clarke (3-44). John Pemberton made a hard hit 35 and Ingham hit a huge six off the final ball of the innings to set the league leaders a target of 4 and a half runs an over for a fourth successive victory.